The emergence of Spanish-language literary magazines became necessary to understand the life of immigrants in Chicago. Now, they are a form of resistance to a government that fights for the reduction of the immigrant figure. One day after Donald Trump’s inauguration as the President of the United States, the Spanish-language version of the White House website disappeared. The removal was related to “technical problems.” People from the government administration continued to promise the future launch of a new version. Trump’s political ideas are characterized by continued actions against immigrants such as his promise to build a wall along the border of Mexico, his travel ban on Latin American and Middle East nations and his September promise to repeal DACA. The President’s actions are also a symbolic act against the Latinx community in the United States. According to the 2015 Census Bureau, there are an estimated 54 million Hispanic people in the United States. The Census Bureau shows that Chicago’s Hispanic population jumped from about 786,000 in 2015 to more than 803,000 in 2016, making it the second-largest racial group in the city. Spanish-speakers in Chicago are present in all industries and professions, a fact reflected by the presence of literary projects and magazines in Spanish in the city. 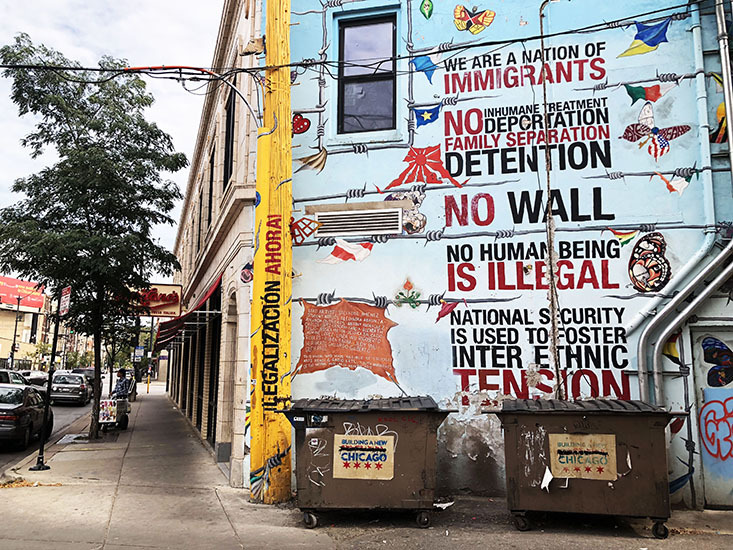 Murals explore immigrant identity in the Chicago’s Pilsen neighborhood. (Oriette D’Angelo, 14 East). Contratiempo is a nonprofit literary magazine that works in Pilsen, a neighborhood in the lower west side of Chicago. The neighborhood is historically a place of importance for immigrants. One of Contratiempo’s former editorial directors, Gerardo Cárdenas, is a Chicago-based writer and journalist who worked at the magazine from 2008 to 2016, where he oversaw the literary section, including poetry and short fiction. According to Cárdenas, the project started as a response to a political event — the invasion of Iraq in 2003. Spanish-language writers wanted to create a manifesto that represented their political and creative concerns. Its founders saw Chicago as a powerful place for the creation of literature written in Spanish. To accomplish this goal, they launched a poetry workshop to start supporting new Latinx authors and to create a community based on their writing interests. 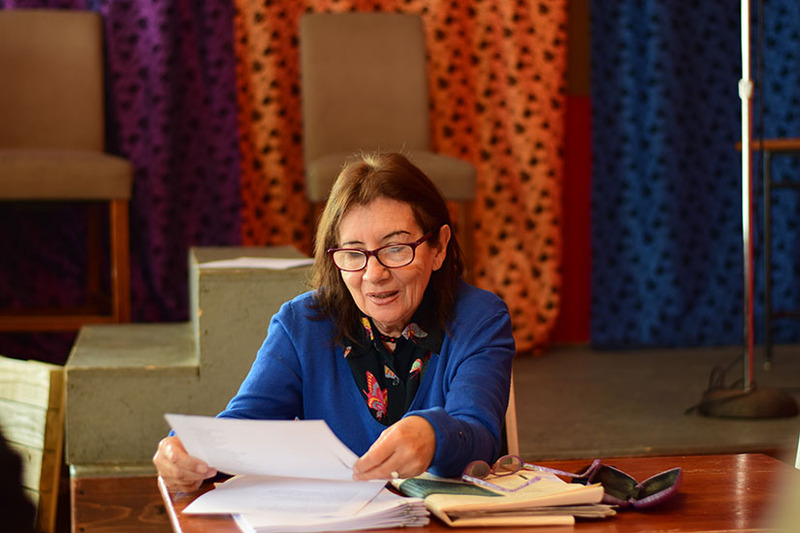 Carmen Ollé, poet from Perú, teaching a Poetry workshop in La Catrina, Pilsen, as part of Contratiempo’s regular workshops. (Oriette D’Angelo, 14 East). Contratiempo was built with one purpose: to prove literature in Chicago was also being written in Spanish. Contratiempo wanted to make sure people knew good literature was being created in the Midwest. “I strongly believe that there is a literary movement in the United States in Spanish that is just as strong as the literature from Hispanic countries,” Cárdenas said. 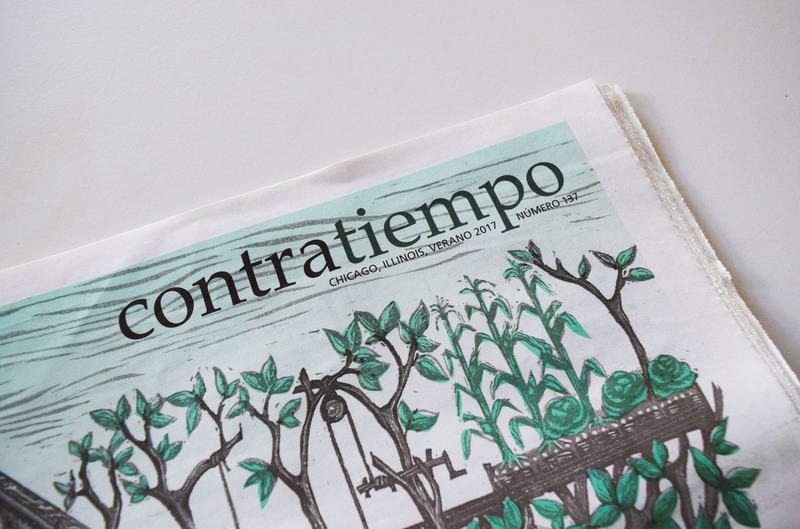 Contratiempo has become one of the most influential Spanish-written literary magazine in Chicago. Today, its executive director Moira Pujols is leading the project to a more social and communal perspective. Based on its current projects, Spanish as a language is a bridge for resistance as all of its events are spaces to reflect and share thoughts about the current political situation in the United States. One of its biggest events is the festival Poesía en Abril, which reunites poets from Latin America and celebrates Spanish writing in Chicago. Pujols explains Contratiempo is also working on a project named Caracol, a public art project awarded to the magazine by the Chicago Park District and The Field Museum. The project represents the desire of immigrants to belong in a new context while also maintaining their identity. Caracol allows Contratiempo to highlight the cultural identity of the Spanish-speaking community, which the publication believes is an important aspect of Chicago’s culture, according to Pujols. El Beisman is a bilingual online magazine produced by a nonprofit collective of journalists and educators. Like Contratiempo, El Beisman works in Pilsen and participates in events highlighting literature written by Hispanic authors in Chicago. Franky Piña, its founder and director, says the purpose of the magazine is to understand the problems of immigrants in Chicago and embrace English as part of their roots. “We can’t deny the English language. We can’t reject it. Everything we produce is in Spanglish. So, as a collective, we want to embrace the American culture,” Piña said. Piña participated in the foundation of Contratiempo, but soon left the project because he did not agree with the direction of the magazine. “They wanted to publish authors from all over the world. They wanted to show universal literature, but I wanted a magazine that talked about the Hispanic community in Chicago,” he explained. El Beisman was founded in 2014 as a product of his discomfort. As soon as he left Contratiempo, he published a book from the artist Marcos Raya. Piña noticed there was a need for something in his community: publishing books by Spanish-speaking authors in Chicago. It was then that El Beisman became a publishing company. As part of “El Beisman”’s philosophy, Piña decided to publish in both languages but divide by genres: art books in English and creative writing books in Spanish. That division appealed to something Piña believed was logical: “Art has no language, but novels, poetry, and essays need language to exist,” he said. Chicago’s Spanish-language literary projects continue to grow. Earlier this year, the event Primer Encuentro Cultural Sudamericano en Chicago reunited Hispanic writers for a reading event for the weekend. Like this event, more festivals are emerging in Chicago to celebrate diversity and understand that regardless of the current political climate, the United States is being inhabited and built in Spanish. Header image by Oriette D’Angelo.